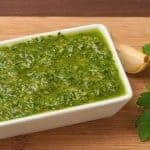 The word “pesto” means “pounded” in Italian, but most of the time, when we refer to pesto, we’re talking about that classic uncooked sauce made with fresh basil, olive oil, garlic, pine (pignoli) nuts and Parmesan cheese. 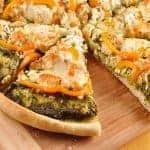 This pesto recipe replaces the basil with a blend of kale and parsley and uses toasted walnuts in place of pine nuts. 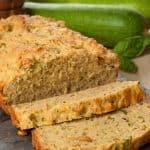 The flavor is a little milder than the traditional version, which makes it a bit more versatile, and as a bonus, the kale adds some extra nutritional punch. 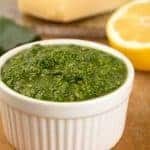 Kale pesto is delicious as a condiment for broiled fish, grilled chicken or steak, or tossed with pasta for an easy side dish. 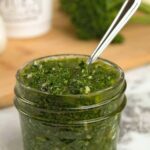 You can also whisk it into salad dressing for added flavor, or serve it as a dipping sauce with crusty bread. Place the kale, parsley, garlic, olive oil and walnuts in the work bowl of a food processor. Pulse until the mixture has the consistency of a thick paste. Add the lemon juice, Parmesan cheese, 1/2 teaspoon salt and a few grinds of black pepper and pulse to combine. Taste and adjust the seasoning and add a little extra olive oil if needed. 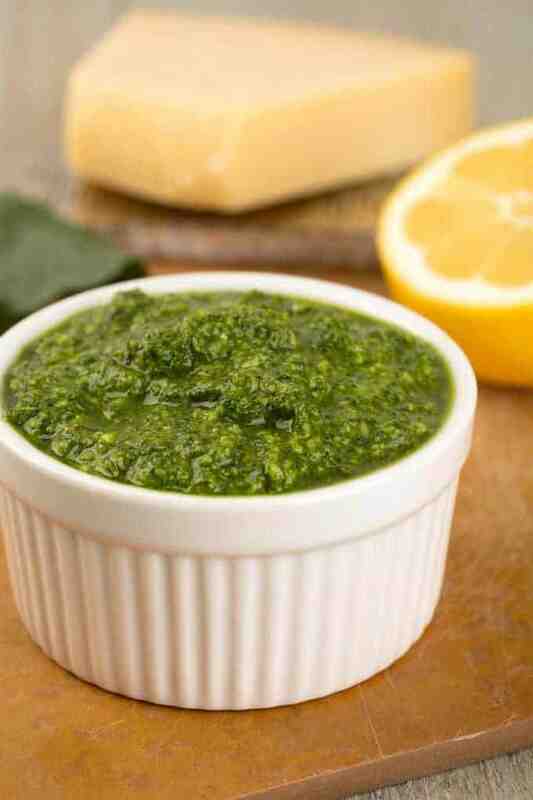 Kale pesto can be stored tightly covered in the refrigerator for up to 5 days. For best results, be sure to remove the tough stems and pat your kale dry with paper towels before chopping. To shorten prep time get pre-washed baby kale. You can just pinch off the longest stems, give it a quick chop and you’re ready to go.